WHY Wally-Hermès Yachts is the new company created by french luxury brand Hermès and monaco based yacht maker Wally, dedicated to a new lifestyle of living on the sea. designing a boat with a new concept is not an utopia. at every turn the yacht offers maximum space, durability and cutting-edge technologies. the exchange with Wally and Hermès was rooted deeply in terms of know how and sharing the same philosophy of this new concept. the boat is contained in a triangular hull measuring 58m x 38m. there is no superstructure. the initial idea of this hull was confirmed by the ramform hull which they discovered, redesigned and adapted to fit the concept of the wheel house that emerges from the silhouette of the ship. the interior of the yacht is fitted out with water resistant buffalo leather using the calpinage technique. the yacht which took years in the making has been tested in gotebourg, sweden, in a specialised tank testing facility, to see how it would perform in big seas. the outcome is that, in full swell, the bow moves a tiny bit and the stern stays completely still. anchored, the boat creates a totally flat surface behind it, like an olympic-size pool where you can swim in total peace. on the bow, there’s a seawater pool 25 metres long that follows the curve of the bow. the environmental and ecological advantages are a strong point of the boat WHY. different sources of energy are managed by a central computer. the yacht is powered using a diesel electric engine. a surface of the photovolatic panels which measure approximately 900 square meters provide the solar electricity generated which covers part of what is needed to subsist the boat. an encounter, … the concept was developed by president and CEO of Wally luca bassani antivari, artistic director of Hermès, pierre-alexis dumas and design director of Hermès gabriele pezzini. a special WHY team has been built to reply to any needs. pierre-alexis dumas: my inspiration is still the greek caïque, roomy, generous and slow. this eulogy to slowness is demonstrated in such a magnificent way. a pared-down craft with nothing superfluous about it. we needed a stable hull in order to hold the sea comfortably. the idea of a triangular hull, which doesn’t exist in the world of leisure boating, came from the utilitarian merchant marine. luca bassani antivari: I came across a picture of a supertanker while reading a professional magazine. a cable-handling vessel, used in the geo-mining and seismological industry in the north sea, invented by a norwegian naval engineer, roar ramde, and fully patented. there was nothing new about this ship. it had been in use for twenty-five years. as soon as I saw it, I picked up the phone and called my consultant naval architect, mauro sculli. he looked in the RINA, the italian naval classification registry: never seen or heard of before in the world of yachting! it was perfect. we had our hull. we bought exclusive rights to the concept, patented strictly for yachting. pierre-alexis dumas: WHY addresses the very real problem of consumption, which is today exacerbated by the global context. we provide an answer in a field where clients are responsible for setting an example, embracing a new ethic. what this market needs is a boat designed with the environment in mind. this new way of moving on water must give way to a new way of managing energy, its sources and uses, how to recycle it, etc. the same goes for the choice of materials; we have to limit the effect on the environment. 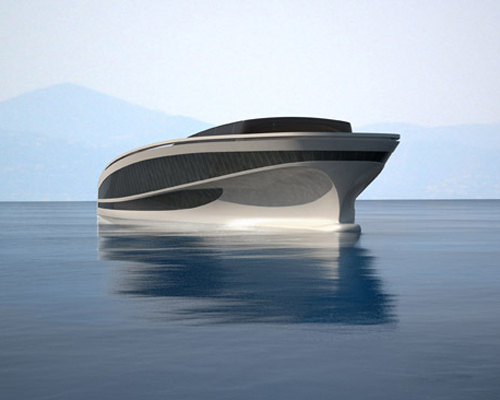 gabriele pezzini: we didn’t design a boat, we gave shape to an idea. the sea is one of the last spaces where people can indulge in absolute freedom. deciding to live on the sea means rethinking everything that’s been done before. you need to start from scratch! for example, we provide a real jogging track inspired by coastal paths running around the ship. above all, we had to transpose and translate functions into forms, and vice versa, by merging the viewpoints of Hermès and Wally. pierre-alexis dumas: ours requires less power at cruising speed than a boat of equal size. its diesel-electric motorisation is the most efficient motorisation out there today, and the surface of the photovoltaic panels, almost 900 square metres, covers part of what’s needed to subsist on the boat! we’re also looking into a telescopic wind-turbine system and a retractable mast with a computer-operated sail measuring over 200 square metres that will produce at least 30 % of the energy used to propel the boat. wow. this is friggin’ huge. Very cool concept. Except for the top which doesn’t fit in with the hull. It is too small. Why not add another level? Now it resembles a speedboat for giants. That’s completely different from what we have seen until now. Interesting mix between luxurious spaces and utility hull. The Yacht is an island, so it won’t be in a harbour it will Float in the sea. finally a yacht whit a private beach! What a complete waste of money! Just let people starve and die all around the world while you float through life you excessively rich a-holes. x dave. Just because someone has money does it mean they should be forced to feed everyone? What if the person who buys this has already given millions to charities? How much more do they have to give until it’s OK to reward themselves? I’ve worked o/shore on one of these Ramforms…. lots of room, ensuite cabins, restaurant size mess, stable hull in a seaway but slow transit speed though. Awoke a number of times to the never ending rust monkey crew busy chipping, cutting, grinding and painting outside my cabin. Are you going to build this composite? It’d be a shame to lay all that fine timber decking over steel plate hull and then go to sea. Working night shift is a bummer when the rust monkeys wake you up! Only Hermes can collaborate and initiate such unique design. The entire envelope throughput plus the internal accoutrements are staggeringly chic and I can smell the Hermes leathers even from my computer screen. Ahhh. No I know why I enjoy anything from the House of Hermes so completely. Congratulations. it even comes with a TREE!!!! awesome! now to win lotto five+ times to afford one. Dave, Yachs like his support hundreds of working class families around he world. They put multiple millions of dollars ino local economies every year in the support work the require. But I guess it would be better to just give the money away. seriously am i the only one who wonders about the price, does anybody has a guess? disgusting wastefullness, but I love it…Sorry Dave. If you need to ask the price, yo can’t aford it. … Avec une piscine à l’eau de mer ! Design wise the WHY has no excesses . Nothing is superfluous. The impact on the sea is minimal. Luxury is not the devil. This is artistic craftsmanship on highest level. I like it. 🙂 . Good work gents. heavy design to my taste. clearely an island, for navigation info given comes close to being a lie, technically speaking that is. wally has done much better than that. hermes is clearly lining up on the marketing wave that bored rich spoiled kids would surf on… sadly loosing it’s ideal it seems. All those sun loungers. Reminds me of the world the fat lazy humans inhabited in Wall-E! And what’s with the curvy ramp? Is this boat gonna have lots of mums with push-chairs..? just PERFECT….congratulations to the designers…WELL DONE…!!! your lovely creature has elevated man’s worth. I guess the design is nice enough: Boutique hotel on the sea, swoopy stealth lines, wood panelling, tinted glass etc etc etc. Not sure you could ever claim such an immense floating white elephant was good for the environment though. The phrase ‘rearranging the deckchairs on the titanic’ has never felt more apt! Is it air-conditioned? How many channels of TV does it have? How much of the ship could I control without getting out of bed? Does the captain’s chair have those massage rollers in it? Is there an artificial waterfall in the jacuzzi? Is it soundproofed and gyroscoped? Does it have Wii Fishing? Yea Harbinger, I totally hear you. Wii fishing is totally meta. I mean do I have to look at the water? Whoa there deepak! Not everyone can be a bleeding heart. Why not just appreciate the beauty of design and the imagination that went into this? vaybee süper ne kadar acaba (how much)?? it is a very good idea.. congratulations . What’s the price of this jewel? it costs 90 m pounds ! Bel ouvrage! Faudra voir la stabilité en per mer formée…mais dans l’absolu, quel beau rêve! La touche Hermès est parfaite, on sent le cuir à plein écran! the earth is dying – lets concentrate on building things that people really need? it is a concept or did you build a real one?